This August, WordPress held the first ever WordCamp for Publishers in Denver, Colorado. 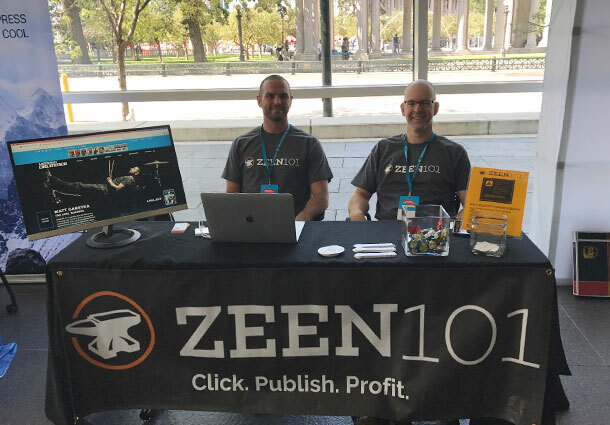 Hosted at the Denver Post building and attended by publishers of every size and shape – including such giants as Condé Nast, the New York Times, the Boston Globe, and the Chicago Sun-Times – it was hardly an event that ZEEN101 could miss. It was a overall tremendously valuable experience (ZEEN101 had a booth and a speaking slot and our own Jeremy Green ended up accidentally giving a lightning talk on adaptive content), but the biggest marketing take-aways came from the case study on advertising presented by Wired magazine. Wired has done a lot of experimentation with ads and how they perform on the web – in fact, they were responsible for the first ever banner ad (below) in the history of the internet – and so they had a lot of insight to share. They started with a few examples of effective sponsored ads – those that incorporate the tag or logo into the copy or design of the actual page. They revealed that, when it comes to audience segmentation, only one or two data points is essentially as effective as twenty. Ads are just not that effective at generating revenue. There are a number of reasons that Wired has found ads unsatisfactory. The most obvious, of course, is that adblockers abound. And though there are ways around them – plug-ins that will delay the appearance of an ad until after the blocker has scanned and moved on – they can still prove prohibitive. In one experiment, they circumvented the whole thing by offering ad-free service for $1 a week. Which led to their next revelation: the true path to revenue for online publishers was to dedicate some time and effort to building an email list. Wired suggested that the best way to earn revenue with online content was to be aggressive about email list-building. Setting up a newsletter of some kind, creating a direct line of contact to an interested audience is a far more effective tool than traditional advertising, according to their studies. In fact, someone on the list was ten times more likely to become a subscriber. And subscriptions are the real income source for most online publishers. Among their other experiments, Wired played around with importing articles directly into external news feeds like Facebook Instant Articles or Apple News, pairing the articles with ads and splitting the revenue. They found the tactic not only financially ineffective, but also unsatisfactory as a marketing tool. Publishers put a lot of time, effort, and money into their brands; that value is diluted on 3rd party platforms when mixed in with other content. The Wired case study was just one of the valuable learning experiences of WordCamp. The entire event was a great way to keep an eye on the online publishing industry and an opportunity to see how it is evolving with the times. If you want to learn more from the event this a great presentation recap page and videos of the event..